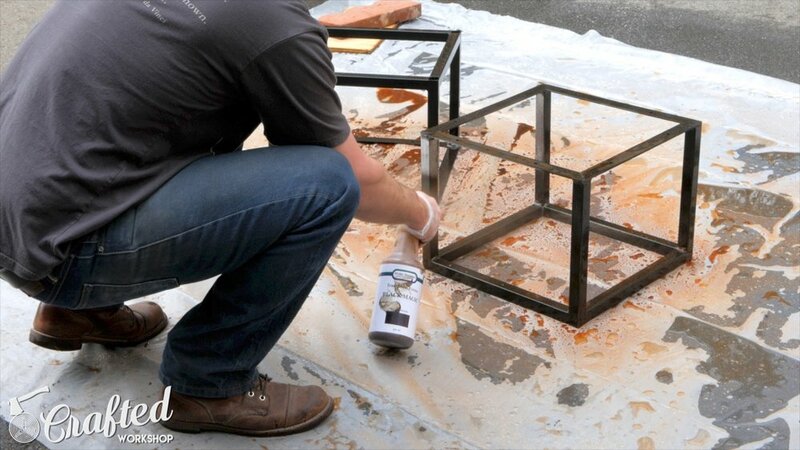 In Part 2 of the Modern Maple and Steel Coffee Table build, I show you how to build the welded steel base. The bases are fairly simple and are a great beginning welding project. Let's get started! I built the bases for the coffee tables from 16 gauge 1” square tubing and ⅛” thick flat bar. First, I broke down the pieces into rough lengths using my metal chop saw, then I used a technique called gang cutting to cut all of the pieces of the same length to size in one pass. Cutting all of the pieces at the same time ensures that they end up at the same length, which can be difficult to do by just cutting to a marked line. Next, I beveled all of the edges of the pieces for welding. 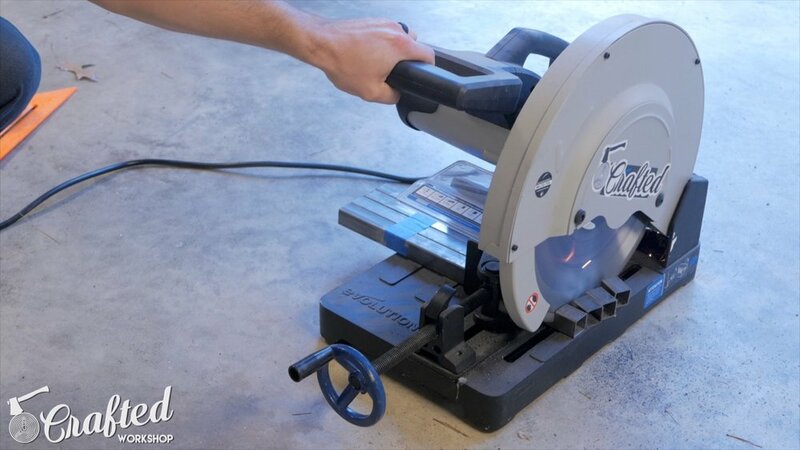 I did this using my belt grinder, but you could use an angle grinder or files if you don’t have a belt grinder. I used my Lincoln Electric Power MIG 210 MP on this build and had it setup to run solid core MIG. First, I welded two of the legs and one cross stretcher together, tacking them in place then running a full bead. After welding the pieces together, I ground the welds flat. After getting the two halves welded, I then connected them with the other two cross stretchers. This base is a fairly simple cube, and there is plenty of strength because of this design. For attaching the base to the top, I used a frame made from ⅛” flat bar. I cut miters on the ends of the pieces, beveled the edges on the grinder, then welded the frames together. Once they were together, I ground down the welds and then drilled the mounting holes into the frame before welding the frames to the base. I drilled the mounting holes slightly oversized to allow for any wood movement. I used ¼-20 bolts to attach the bases to the tops and drilled 5/16” holes. To weld the frames to the bases, I tacked them in place then ran full beads on every edge. As you can see, I really need to upgrade my welding table. This wooden table doesn’t work so well when the weld areas get hot and the table caught on fire a few times. A metal welding table is in my future for sure. After getting the frame welded to the base, I cleaned off all of the mill scale with a flap disc and then a random orbit sander. I only did this because I used a metal patina to color the metal, but if you were just going to paint the metal, you just need to clean off any dirt and oils. Speaking of the metal patina, I used a product called Black Magic from Sculpt Nouveau to color the metal bases. The first step is to clean the metal and remove any grease and dirt. I used a metal degreaser for this, then rinsed the bases off. To apply the patina, I sprayed it on pretty heavily using a spray bottle, making sure to cover all of the surfaces of the bases, and then let the patina sit for a few minutes. The longer you let the patina sit on the metal, the darker it will become. Once I was satisfied with the color, I rinsed the bases off, making sure to wipe them down to remove any excess patina. I let the bases air dry for a few hours, making sure they were completely dry, then sprayed a few coats of a satin lacquer to seal them. The final finish is a deep black, textured look that has a lot more depth and character than a painted finish, I really love the way it turned out. Once the lacquer dried, I added some plastic feet to the bottom of the bases, and I’ll have links to these in the video description. These really help to keep the metal from scratching hardwood floors and the like. Next, I centered the base on the bottoms of the tables and marked where I needed to drill the holes. To attach the bases to the tops, I drilled the holes and then threaded them using the Wood Whisperer Thread Taps. This worked great and was extremely fast, and the holding power is pretty incredible. The bolt just threads right in. Next, I needed to install the all-thread into the tops. The all-thread I purchased was sold in 36” lengths, so I cut them down using my metal cutting bandsaw, although you could use a hacksaw as well. I then ground the ends at an angle so that a nut could still go on and off easily. I used my belt grinder, but you could use files or an angle grinder. To attach the all-thread, I used a ¾” nut and ¾” flat washer on each end and tightened them down lightly. Again, this is really just for show, so no reason to go crazy tightening the nuts. Finally, I added my stamp to the bottom of the tables and then installed the table bases using 1 ½” ¼-20 bolts, a lock washer and flat washer. With the bases attached, the tables were finished. Hopefully you enjoyed this two part build! If you missed part 1, make sure to check it out here. If you have any questions, let me know in the comments section below.